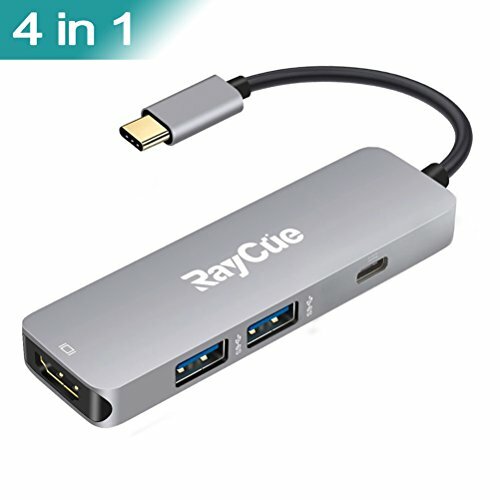 Type C HUB to HDMI, USB C HUB to HDMI, Type C HUB, 4 in 1 USB C HUB with 2*USB3.0 and PD, USB C to HUB to HDMI Adapter for Notebook & Tablet PC & Phone --- MacBook Pro/Air, Chromebook, DELL XP etc. →Instant Expansion← Equipped with USB C HUB- USB-C / M Hub to HDMI / F + 2 x USB3.0A / F + PD (Charging) Adapter. Enable insert 4 devices simultaneously. Expands USB C devices and meets your daily needs. →Plug & Play← No need any dirvers, software or installation. Support data transmission and HDMI output. Expand your devices connectivity, excellent quality and solid but light weight. →High Resolution & Super Speed← Reach to max resolution of HDMI 4K@( 3840x2160P)30Hz; Transfers data at incredible speeds ( 5Gbps ), which gives you the way to transfer a high-definition movie in seconds. 1. Make sure that the resolution of your monitor meets the requirement. 2. Please plug the charger when using, otherwise the video will flash screen and U disk will be discarded. 3. When using Samsung 8, the Hub does not read data on USB3.0 U disk or hard drive. Even if it's read, it will be unstable. →Instant Expansion← Equipped with USB C HUB- USB-C / M Hub to HDMI / F + 2 x USB3.0A / F + PD (Charging) Adapter. Enable insert 4 devices simultaneously. Expand USB C devices and meets your daily needs. →High-Technology← Constructed from high grade aluminium alloy shell and milled with exact precision; Faster heat dissipation; Mainly design for reading USB extra device/ HDMI Output. →Compact & Compatibility← Design for easy-to-use; Simple to take the Type-C USB Hub with you anywhere you go. Compatible with all new MacBook, DELL XPS15, HP Spectre X360, Chromebook, Lenovo , Samsung Tablet, Huawei Matebook.